This past weekend was strawberry-jam-making madness at my house, but that post is to come later on. I think Melanie's post from last week about the birds in her yard inspired me. This post is a short story about two thrifty little birds. compost bin and put it on a branch in their pine tree. A pair of house finches have taken up residence in the pine tree by the side of our deck. The Mister has a pretty red head and chest, and he and the Missus go in and out of the branches to their nest all day long. The expectant couple (I know this because they had an egg fall from the nest onto one of the branches of the pine tree just the other day) take turns going back and forth from the bird feeder to the tree, and they generally keep me and my dog entertained while we relax on the deck. A few months back my husband built me a compost bin, which I now use all the time. Saturday evening I contributed about 10 quarts’ worth of strawberry tops and a few whole strawberries that had expired to the bin. The finches took notice. As it turns out, they like more than just black sunflower seeds — it seems they like strawberries, too! 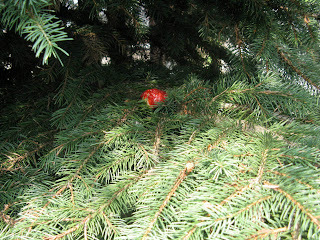 One of the finches plucked a big, yet bruised, strawberry from the compost bin and set it in the pine tree branches (see photo above) for an all-day buffet. I first saw it there around 9 a.m. on Sunday, when the photo was taken. I noticed in the evening that the strawberry had been moved farther out on the branch and had quite a few bites taken out of it. I went back this morning to check on it, and the strawberry was gone. Mr. and Mrs. Finch must have finished it off for breakfast! The strawberry in the pine tree made me curious — I wanted to know more about their diet. I looked up “house finch” in The Bird Watching Answer Book, and I found out that wild fruits are part of the finches’ diet. When they eat fruits rich in carotenoids, their feathers grow in bright red. I guess, then, the strawberry scraps from my compost bin are contributing to the Finches’ pretty plumage. I was surprised by the list of other birds that enjoy fruit. I'm definitely going to share mine with the birds from now on. Thanks for such an informative post!